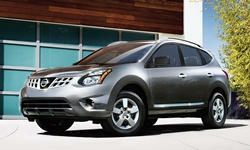 Nissan Rogue Select Pros and Cons | Page 1 of 1 | Why Not This Car? What drives people to buy (or not buy) a certain car? TrueDelta's members share Nissan Rogue Select pros and cons based on their real-world driving experiences. At first this unit was fun to drive and had decent fuel mileage but not what I expected. After some time the mileage did finally reach what I was told it would do. DId handle fairly well and was lets say sporty to drive.